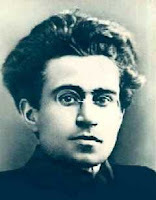 Marxist theoretician Antonio Gramsci was one of the most destructive individuals in world history. His work still inspires the gradual disintegration of western society that has been growing steadily worse in recent times. But it appears, that Gramsci, the hero of millions of socialists and communists worldwide, lacked the courage of his own convictions. Wasn't he wracked with tuberculosis? Well Trev, not so long ago you slagged off Matt Robson (perfectly reasonably), saying sarcastically "Matt Robson shows the compassion and respect so common on the left". Now you dub somebody a coward for something silly he did on his deathbed after years of deteriorating health, aggravated by being locked up if fascist prisons. Bit hypocritical isn't it? I'm no Gramsci fan, but I don't see any reason to call him a coward. Notice when these people are on their death bed, they always start thinking!!!! They realize they are wretched heathens LOL at that point, no more being the tough guy! More books should be published with those deathbed confessions. Hanging over the cliff by my well chewed fingernails would have me swearing communism was capitalism or visa versa depending on who was offering the helping hand of salvation. Having stared death in the face i realised I was leaving behind unfinished business. Call me shallow if you must, but i made ridiculous promises to which ever higher authority was monitoring my life at the time. I feel terrible that I eventually reneged and went back to my wayward life. Maybe next time I'll go without a fuss. I don't see how this makes Gramsci a coward? is the vatican really the most credible source? come on. the roman catholic church has always been an ardent supporter of capitalism and an avowed enemy of marxism. i'm sure they would do anything to discredit one of the most important cultural theorists of the 21st century who is enjoying an upsurge in popularity these days, especially since gramsci was a lifelong member and leader of the PCI. we certainly can't have any marxists making major contributions to social thought now can we? this whole thing beautifully demonstrates the process of maintaining hegemony that gramsci wrote about. they set themselves up as secular saviors of the world. How many more lives must be sacrificed at the altar of these false & empty ideologies before they are acknowledge the truth?